Mish's Global Economic Trend Analysis: Déjà Vu Weather? No, It's a Recession! Yesterday Fed Governor Stanley Fischer proclaimed U.S. Economy Should Rebound After ‘Poor’ First Quarter. “There’s definitely a rebound on the way already, and we’ll see at what speed it proceeds,” Mr. Fischer said during an interview on CNBC. “The first quarter was poor. That seems to be a new seasonal pattern. It’s been that way for about four of the last five years. Richmond Fed President Jeffrey Lacker said Wednesday that he thinks a “strong case” can be made to raise rates at the Fed’s June policy meeting, and suggested the economy’s recent performance may have been weighed down by temporary factors. The Atlanta Fed Macro Blog investigates Fisher's claim in Déjà Vu All Over Again. Output in the first quarter has grown at a paltry 0.6 percent during the past five years, compared to a 2.9 percent average during the remaining three quarters of the year. Is there really a pattern? I see two weak Q1s, one weak Q3, and one weak Q4. 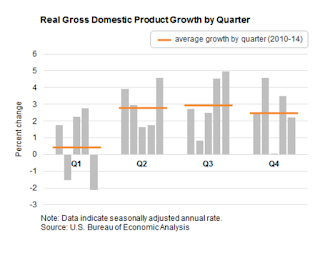 If you call anything under 2% annualized growth weak, then Q2 had two weak quarters as well. Is this a pattern or a random fluctuation? Regardless, Fisher's claim that a poor Q1 "seems to be a new seasonal pattern. It’s been that way for about four of the last five years" is false. 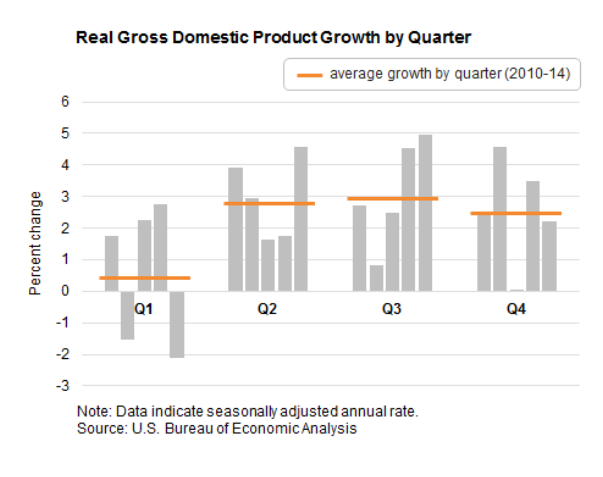 What really happened was two "bad" as opposed to "weak" Q1 quarters in five years, and that brought down the Q1 average. Even if that constitutes a pattern, it's as likely to be random or meaningless than "new seasonality". If this winter took a couple ticks off GDP, and even if there is a "pattern", does that warrant Fisher's Optimism? No it doesn't. Fisher's optimism is only reasonable if the weakness was entirely weather related and the underlying fundamentals are the same. Neither is true. In fact, I think a recession has started. The US dollar is up 22% since the beginning of the year. That is sure to hurt exports. Hikes in minimum wage by Walmart, McDonalds, etc. will not only hurt corporate profits, but they will slow expansion plans. Would you want to buy a McDonald's franchise with all this pressure for $15 wages? Credit conditions are recessionary, and you cannot blame this on the weather. See my report Credit Crunch Underway: Can Recession Be Far Behind? Equities and junk bonds are in a clear blowoff bubble. A huge correction is long overdue. Indeed, it would take a 33% haircut just to get equities back to reasonable valuations. Finally, this is the start of the 7th year of an expansion. The San Francisco Fed notes "NBER records show that, over the period from the mid-1940s until 2007, the average recession lasted 10 months, while the average expansion lasted 57 months, giving us an average business cycle of 67 months or about 5 years and seven months." I am increasingly confident in my recession call. In fact, unless data immediately rebounds and holds over the next two months, a recession has likely started.